See here for a documented record of Mo’s “previous” if you’re interested. ROTFLMAO!!!! Perfect, as usual, and hilariously so! So Funny,So Clever,So Simple,and So Very True !!! I’m glad I had just put my coffee down before reading this one otherwise you’d be owing me a new monitor. Yes! One of the best, and a true laugh out loud. A real treat! Breaking an ancient American Halloween tradition of not revealing who they really are, the republican party has convinced evangelicals that their Mormon Mitt’s a Christian in disguise and it’s o.k. to vote for him. At first I asked myself how anyone in their right mind could believe that story, then I realized that this question actually contained the answer. Author, bravo. Another flash of brilliance. Thanks. Or do you just like to hear yourself bray? they could have changed clothes with each other i think. Jesus have mo’s clothes and mo have jesu’s clothes. 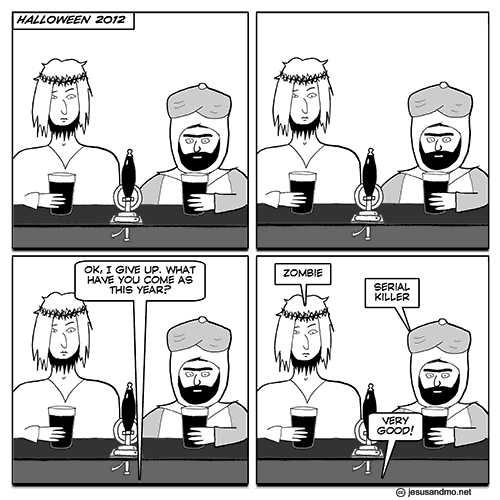 I hear that Jesus did go trick-or-treating, but the sweets just seemed to slip through his hands. DH, there’s a reply to you about cheese in a can on the last thread. I could have sworn Mo was dressed as a child molester. He would have, but the police wouldn’t lend him one of Jimmy (every now and then the idea of Hell seems appropriate for some) Savile’s tracksuits and his jingle-jangle jewellery. A sense of hunour is a sense of humour. Wonderful, Author. Made my day. Isn’t Mo going as a serial killer and child molester? I’m thinking Nightmare on Eid Street. AofS I keep forgetting that things have changed in England since my last visit. They’ve changed in my country too, and I would have recognized the reference to Cheese Wiz except it came in a jar and spread like peanut butter. Sickening stuff. And yes, my mom did feed it to us unschooled kids. I didn’t taste real cheese until I was an adult. Now there was a revelation. I see I must retract my oxymoron about British cuisine. I’m out of date. Yes, using what history as a guide he was going for that look. Save your swearing for the “I am not a spammer” check box at the bottom. Christ Almighty! 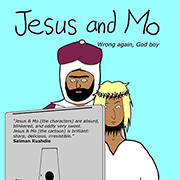 Those Canadian atheists have no sense of humour at all (follow link http://canadianatheist.com/2012/10/31/jesus-and-mo-wednesday-october-31-2012/ supplied by Veronica Abbass above). Half of the comments following the re-posted comic are actually defending Mo from the ‘libel’ and ‘slander’ that Author has heaped on his head. Really! “As for Barmaid’s ‘ambiguous’ response. Do you see the exclaimation mark after her words? She’s congratulating them for finally realising the truth of what we atheists have been saying for ever: If the JC story were true, then he’s a zombie; if Mo’s story is true, he’s a serial mass-murderer (his paedophilia and TLE is dealt with elsewhere in the comics). Sitting on my stoop night before last, sipping a glass of wine while handing out milky ways and hershey bars to little princesses and batmen and greatly enjoying the parade of personalities, and costumes, I was approached by a teenage girl with a smile on her face saying, “I don’t want anything. I just want to give you this.” I knew before I even took it from her hand that it would be some form of proselytizing material. Believe it or not, it was a comic-book story about a guy covered with tatoos, in his twenties, living with his aunt and uncle. He was having nightmares about zombies coming to get him. The fine upstanding christian relatives told him god was talking to him through his dreams and they then began reading scripture to him to save him from becoming a purposeless, wandering zombie. Basically, they were telling him to follow jesus. I kid you not. The lesson was stop thinking for yourself, join a starry-eyed hoard who flock to the same location once a week and drone-on in group monotone prayer and then line up to eat their saviour’s flesh and drink his blood. Author, your genious is superb and the coincidence “miraculous”. It kind of begs the question, if one were to come across a broken irony meter just lying in the sand, wouldn’t one have to conclude an intelligent discerner left it there after an encounter with a brainwashed zombie? Noreligion2, obviously I was referring to the C.A’s on the site, not a one of them got the joke, which I’m sure isn’t a fair representation of Canadian atheists in general. That Joe fellow’s arguments to me were just a series of Wikipedia definitions so I kindly pointed out that Wiki definitions are largely written by people who define the terms to mean what they want then to mean – very much lke the hoy books. Your Halloween experience has given me an idea. This year we should all print off a few J&M’s (with Author’s permission, of course) and turn them into cards to send to our religious friends at Christmas. Or maybe Author could do a deal with Hallmark?…..
No, not ambiguous! They came as themselves. So true! Surely, that’s a moral advance? Yes, but we’ve seen these advances before, but they’re only ever transitory; brief flashes of reality before the shutters come crashing back down. A little like Nassar’s contributions. Or at least as he’d have us to believe, eh Hotrats? Only kidding, my hypothesis is on hold awaiting further developments. From a pre-Celtic rite, long decaying. By the way, nothing about the modern custom of Hallowe’en is European, not even pumpkins. No, not a sub-doggerel, an under-doggerel! But the priest, he says “So? And then sticks his head back up his arse. AofS. Oh no, the limerick has broken out again and you’re giving NBH a run for his money. It’s like the dreaded luuurgey all over again. And threats of reprisals obscene? DH, yeah, I know. I was just following up on Noreligion2’s heartfelt cry for answers. @DH – Quick! Take this trombone! I’m loathe to say ‘best yet’ but it would be close. You cracked us all up at work the other night. Anybody else think the world’s just that little bit safer now the election results are in? I’ll bet the Palestinians are breathing slightly easier this morning. @ AoS – Agreed, what a relief. Yes, me too. I’ll sleep easier tonight. Come on; if you’re going to berate us in limerick, at least make it scan. David – don’t even try! Many of us have been driven to the brink of madness through trying to teach Nassar the basics; it’s like talking to a slightly intelligent wailing wall.